The arrangement of concrete mixing station is an important work in the construction of concrete mixing station. It involves many aspects, such as venue, transportation, funds, to a certain extent also affects the working efficiency of the concrete mixing station. 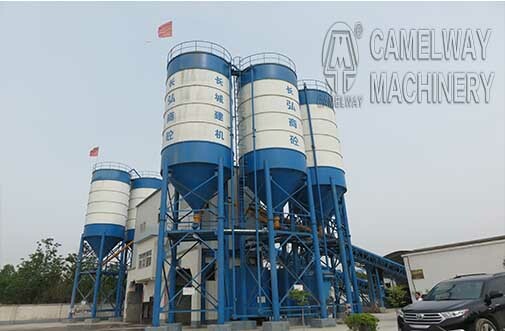 Today, Zhengzhou CamelWay Machinery will give you some guidance on arrangement of concrete mixing station. Decoration of concrete mixing station is generally divided into vertical type, horizontal type, and mobile type. Concrete mixing station vertical arrangement: a single material to ascend, and then by falling weight to each working procedure. The advantage of concrete mixing station equipment is of high efficiency, cover small area, easy to implement automation; The downside is complex, the manufacturing cost is high, the height at the installation; Level of concrete mixing station layout: the material must be a boost to the storage hopper, material after weighing again ascend into concrete mixer. The advantage of concrete mixing station equipment is simple structure, less investment, small building height;The disadvantage is that the material need to pass the second promotion, low efficiency, low degree of automation. Mobile: feeding, material storage, weighing, mixing and discharge device are installed in the same base. The advantage is compact structure, easy to carry, can be directly near the construction site, thus it can reduce the concrete conveying distance and improve the economic performance. If you have any questions, you can make contact with us. Welcome to leave a message.